A two years old Mohammad lays in his mothers arms on the bed of CRENI clinic where he was admitted for clinical treatment of severe acute malnutrition with medical complications. A nasogastric tube is used for feeding and administering drugs. 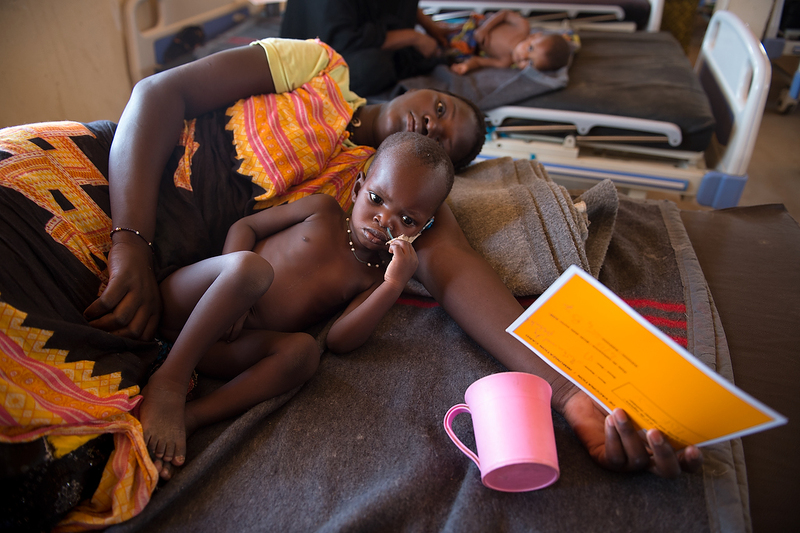 Recovery ward in CRENI hosts clinically treated children for malnutrition with medical complications, who after initial five days are showing projected recovery. Usually children from this ward in few days are ready to be discharged and referred to Out Patient wards of CRENAM centre where they continue to be observed until full recovery. In the Mbera refugee camp, the Nutrition survey carried out in November 2014 showed a significant decrease of both global acute malnutrition (from 11.8 to 9.9%) and severe acute malnutrition (1.4% to 0.8) rates. As of today, UNICEF has been supporting the government nutrition center in the treatment of 444 severe acute malnutrition (SAM) cases and contributed to the treatment of 790 other SAM cases.